Happy Friday & Halloween Eve, everyone! What are everyone's plan/going to dress up as? I am being extra lazy this year and just planning on being a "smarty pants" - tape some smarty's on to my pants and call it good....but I am so excited to munch on all the "spooky" treats all weekend long! Hello cavities! We traveled from Pattaya back to Bangkok using the bus system and from there we took a taxi to our hotel. We stayed at the Banyan Tree Hotel and the Centara Grand since we got a super good deal via Agoda. 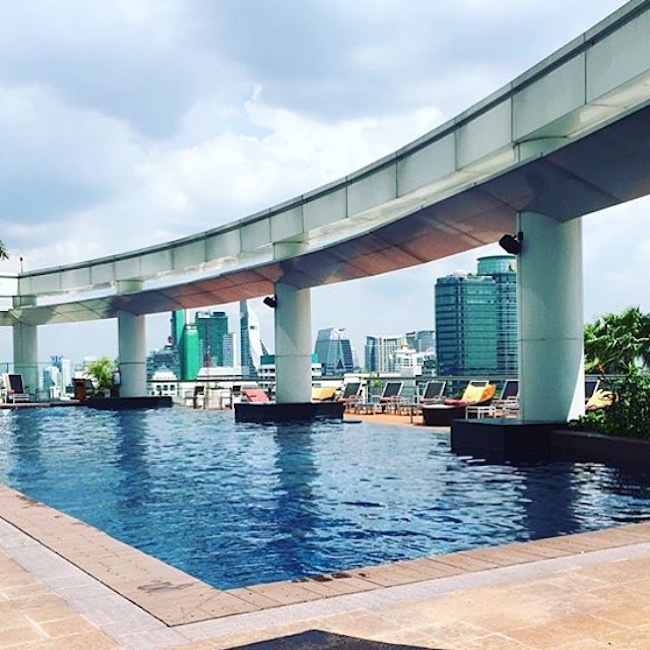 Central Grand at Central World - Rooftop bar! 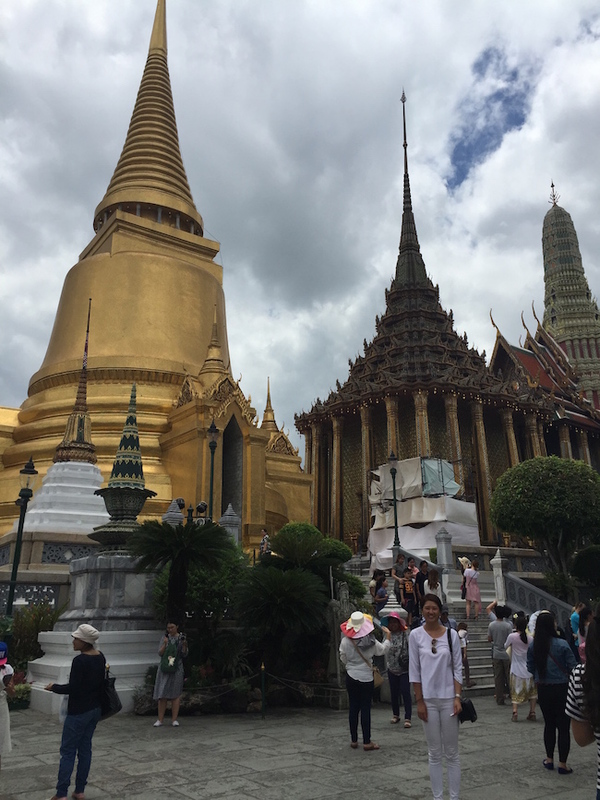 The Grand Palace - Casually sweating balls.....it was so hot. The Grand Palace - Every detail of this place was so beautifully designed - definitely a must see if you are in Bangkok! Wat Arun - my absolute favorite temple. Words can not describe how beautiful this palace is - simply breathtaking! Wat Arun on the Chao Phraya river at the night time! Chinatown! It is a lot more lively at the night time than the day time! Being obsessed with coffee shops can only result in one thing: lots of sleepless nights - the amount of coffee and scones/local sweets I had was unreal, but how can anyone say no to sitting in a cute cafe and enjoying some coffee and sweets? 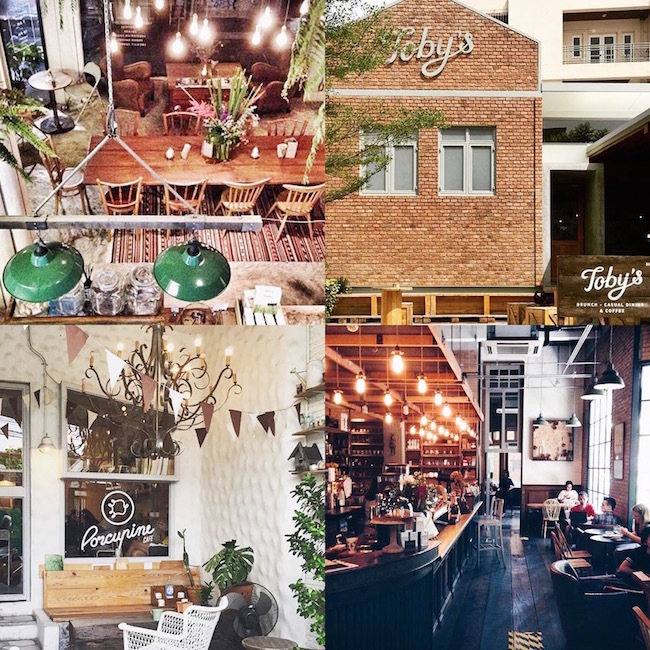 There were so many cute coffee shops in Bangkok, it was just oh-so-fabulous. More adorable cafes that we stopped at! 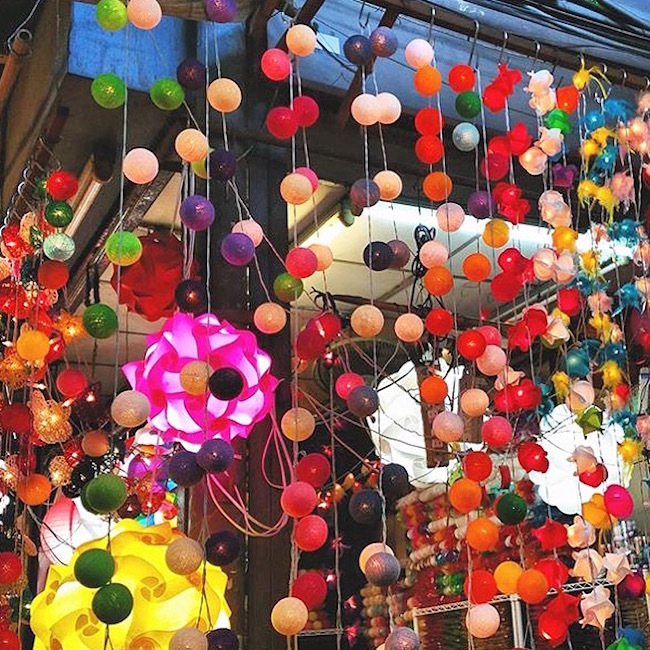 Everything was super bright and fun at the Chatuchak Market! Great place to get some local souvenirs! Erawan Shrine - The most famous Four Faced Buddha in Thailand. Earwan Shrine is famous for making all of your wishes come true! Make sure to wear proper clothing and be extra respectful around the temples. Outside of the EmQuartier Mall! Chanel anyone? 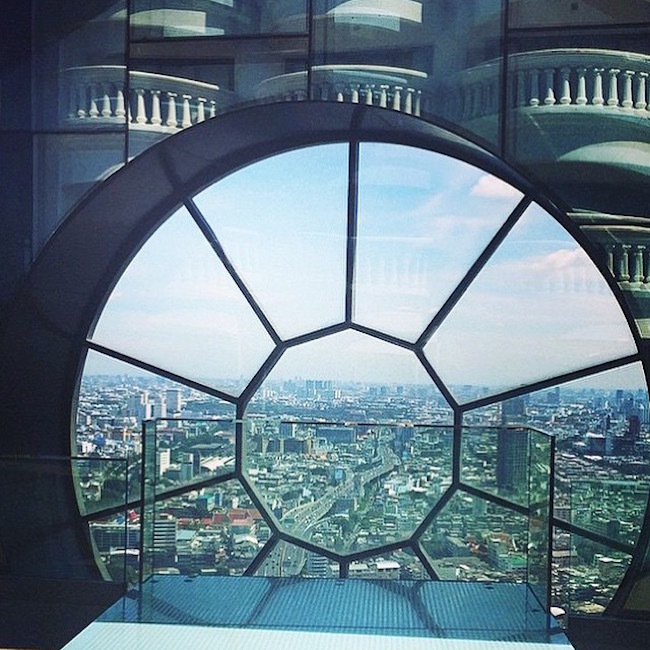 We sweet-talked our way up to the Lebua at the State Tower Hotel where The Hangover was filmed at! How cool is this view tho?! Cutest spa ever! Divana Spa - highly recommended! Divana Spa - they also offer the most yummy complimentary Mango Sticky Rice and Sweet Green Tea! 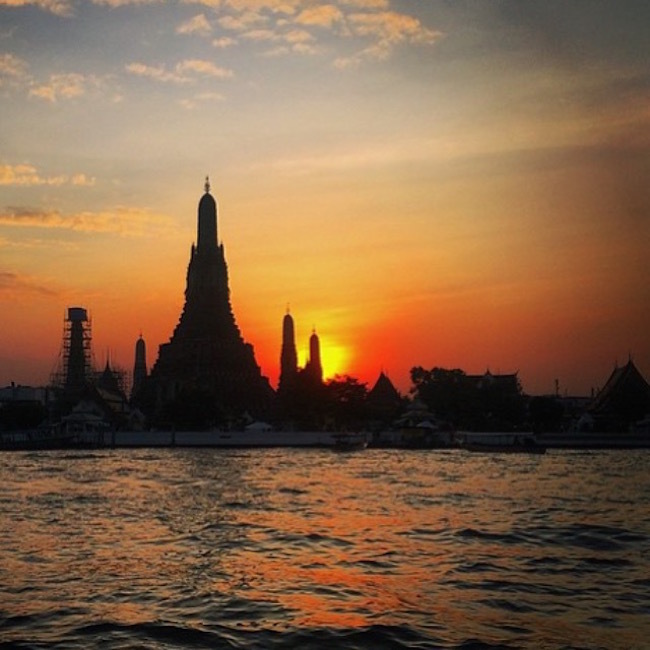 Enjoying the beautiful sunset on Chao Phraya River while overseeing the Wat Arun temple! Until next time, Thailand! Cheers! Food: SOOO much yummy food everywhere! 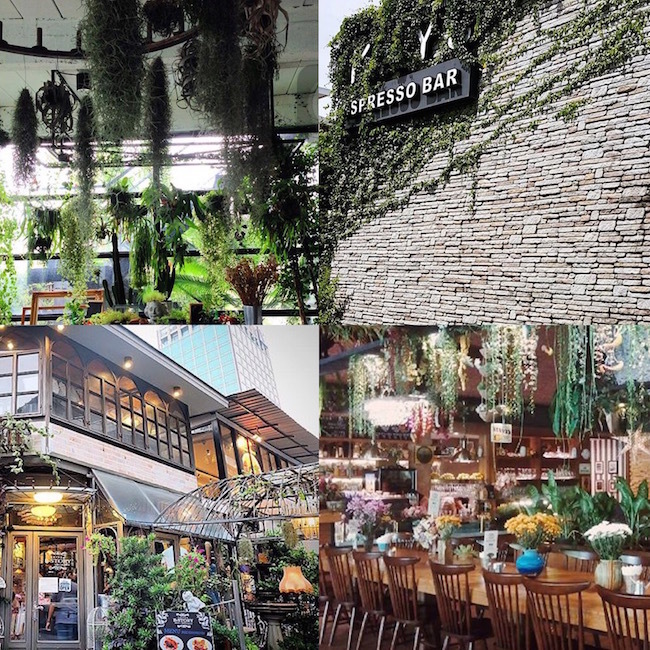 One of my favorite activities that we did was "cafe hopping" - I am obsessed with coffee shops and I was beyond excited by how many cute and trendy cafes there were in Bangkok! Sersiouly, they were all soooo cool! I loved Broccoli Revolution, Topy's Cafe, Casa Lapin Cafe, Town Tree, Kays Espresso Bar, B-Story Cafe, PATA Plantation, and Porcupine Cafe!! All so great and adorable! And call me basic..... but I loveee rooftop bars. I know rooftop bars can seem very "cliche" but nothing gets me more excited then a bottle of wine paired with an amazing view of a city! 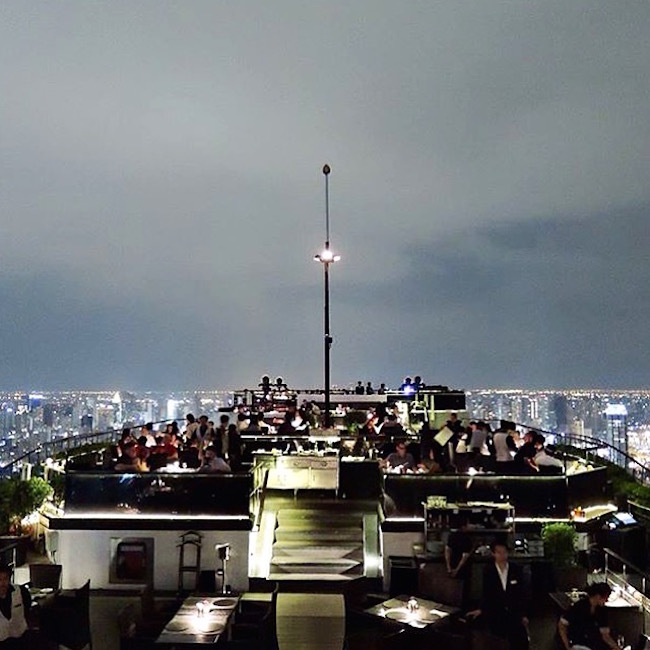 I loved the Vertigo and Moon Bar the most, but more options here: Bangkok rooftop bars! Transportation: Bangkok was infinitely 1000000 times easier to navigate compared to Phuket and Pattaya. Traffic can be a pain in Bangkok, but with the modern public transportation system, such as the BTS, Skytrain, Taxis and Tuk Tuks, you can get around anywhere and everywhere in just a flash! The Skytrain (BTS - most convenient in my opinion) and underground (MRT) rail system connects to the main shopping, entertainments, and business areas of the city, while river taxis and boats can be used to explore historic sites and attractions at the riverside. Taxi's might be easier in some cases and they can be found at almost every corner, but make sure to ask the drivers to use their meters! I don't highly recommend using Tuk Tuk's or Motorbikes, because they aren't well-regulated and can be dangerous, but if you have never ridden one - this might be a fun little adventure for you to try! 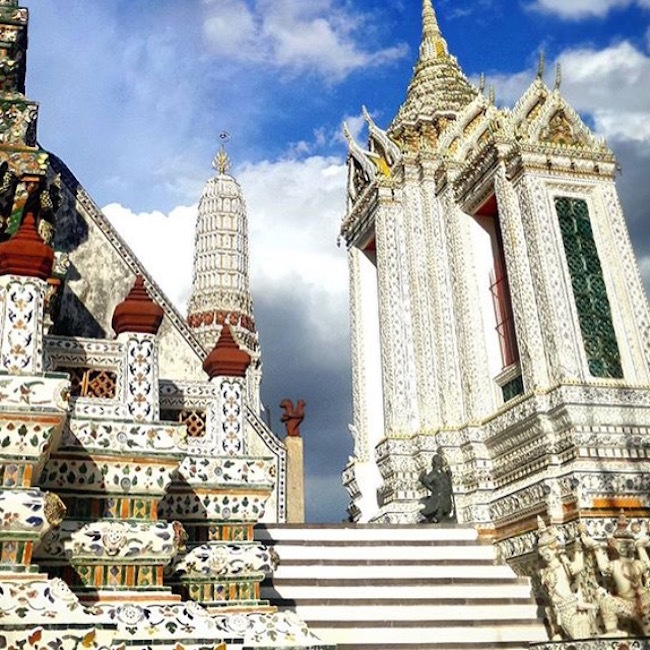 Grand Palace & Wat Prakeaw: The Grand Palace is undoubtedly the most famous landmark in Thailand and it is the one must-see sight that any visit to Bangkok would be complete without! It is the home of the Thai King, the Royal court and the administrative seat of the government. The architecture is articulated to perfection and every detail of every single inch of this Palace is simply breathtaking! Wat Phra Kaew: Wat Phra Kaew or "Temple of the Emerald Buddha" is known as the most important Buddhist temple in Thailand. Is is located within the grounds of Grand Palace. Important note about the Grand Palace: The temple of the Emerald Buddha is Thailand's most sacred site, therefore a strict dress code is applied to all. Visitors must be properly dressed before allowed upon entry. Men must wear long pants and shirts with sleeves and women must be similar modestly dressed (no see through shirts, tank-tops, short skirts, etc)! However, if you forget to pack modest attire, there is a booth at the front gate that provides proper clothing for you to rent! Opening hours are 8:30 - 15:30! And tickets are sold for 500 baht per person! Wat Arun: Locally known as Wat Chaeng. It is located on the west bank of the Chao Phraya River. The combination of this temple being so close to the water and it's beautifully built design- makes it hands down the most stunning temple that I have ever visited! 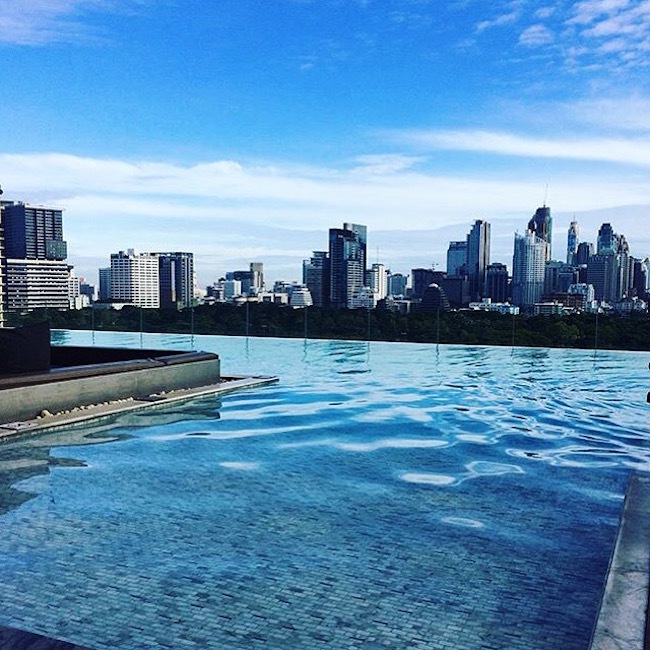 If you only have a day in Bangkok! This temple is also known as the Temple of the Dawn because it is absolutely stunning at sunset! 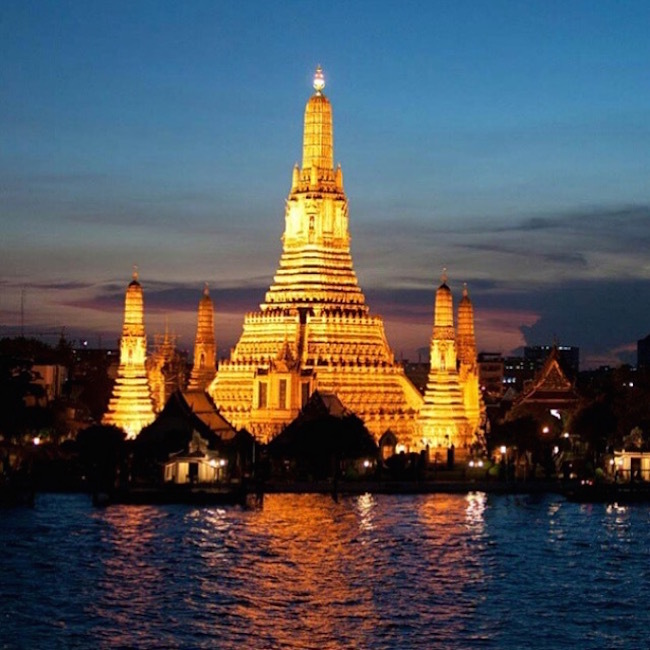 Get to Wat arun by going to Sapphan Taksin boat pier, where you can take a river boat that stops at pier 8. From there, you can take a small shuttle boat that takes you from one side of the river to the other for about 5 baht. The entry to the temple is 100 baht. This temple opens daily from 8:30 - 17:30! The quietest time to visit is in the morning before the crowds! Floating Market: We went to a floating market back when were at Pattaya, so we didn't go while we were in Bangkok, but we met some friends who did go and they loved it! 1) Amphora Floating Market: The more touristy and more popular floating market out of the two. Lots of canals, shops, and restaurants where vendors sell homemade food and sweets! There are also a few bars located towards the end of the street, but make sure to get there early since it gets jam packed by noon! There are also two tours available for you to explore the surounding areas more: the temple tour and the island tour, they both coast 50 baht per person for jointed tours or 500 baht for a private boat! 2) Bang Khu Wiang Floating Market: Less crowed out of the two! More traditional compared to the Amphore Floating Market, however, it is a little more difficult to get to - so make sure you do your research beforehand! Of course, there are a lot of tropical fruit, veggies, as well as fresh and ready-to-drink coconut juice. Yum! Erawan Shrine: The most famous Four Faced Buddha in Thailand. 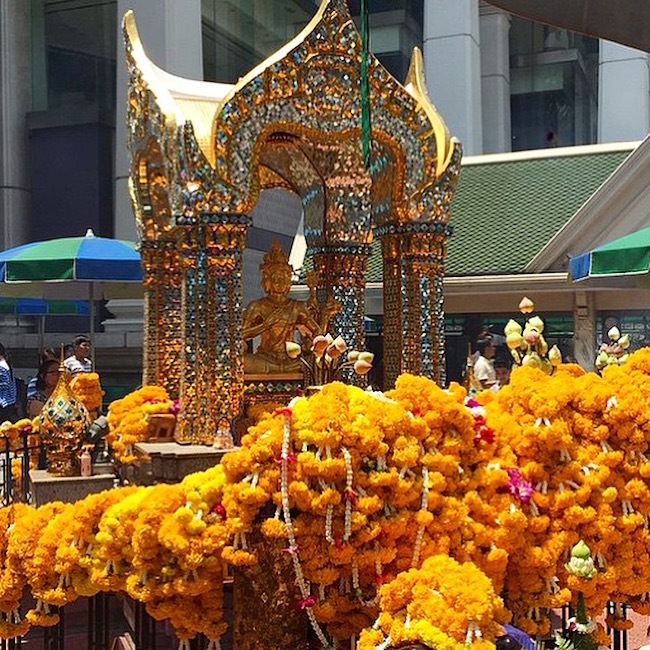 Erawan Shrine is famous for making all of your wishes come true! Located in the central of Thailand - in front of Grand Hyatt Erawan Hotel. Make sure to wear proper clothing and be extra respectful around the temples. Chinatown: Funny how I went to Chinatown when I was traveling from China, huh? haha....but it was a lot of fun exploring this street and I got my bubble tea fix while I was there! 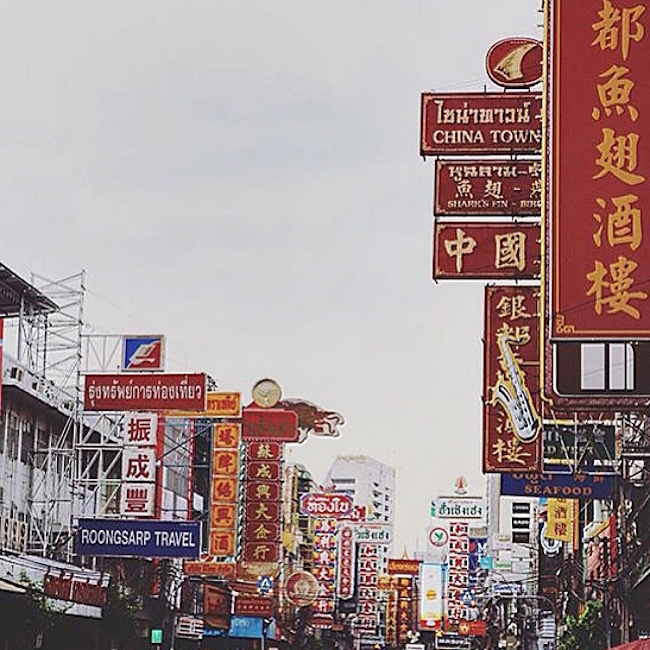 :) Bangkok's Chinatown is one of the most popular attractions in Bangkok - it is packed with restaurants, street foods, market stalls, and gold shops! The streets become vibrant during the night time vs the day time! Khao San Road: Khao shops sell handcrafts, paintings, local fruits/sweets, and books. During the evening time, the streets turn into bars and backpackers usually meet there to discuss their next adventure! This area is known as the center of partying, dancing, and it is where the Songkran Festival - Thai New Year take place at on April 13-15 of each year! Make sure to stop by at the night time and grab a drink and some local street food! Partying in RCA: If you are down to have some fun before leaving Bangkok, definitely go check out the RCA club. This place has been named as one of the best nightlife scenes in the world! So put on your party pants on and go clubin'! And ladies, if you tends to shop til you drop, Bangkok is the place for you! The malls in Bangkok are phenomenallllll!! My cousin and I spent most of our nights exploring the malls - there were so many and all of them are so cool! Terminal 21, Sukhumvit Road: I loved Terminal 21 the most out of all of the malls we shopped at! Terminal 21 resembles a 21st-century airport, and the theme continues once you are inside. This mall is so cleverly designed it is mind-boggling - each floor level represents a particular city and there are electronic display boards, signs, and information desks where receptionists dressed in air hostesses' uniformscoordinate with the "airport" theme design. Terminal 21 has nine floors total and over 600 shops! It also has a cinema, supermarket and an amazing food court! Make sure to stop by at each floor and treat yourself to something sweet from each city! (pretty sure I was on a sugar high all day, because #sweettoothprobs - meaning I cannot say no to sweets...ever.) Also, this may sound weird, but the bathrooms on each floor are also themed based on the city and they are all super cute - definitely doesn't hurt to check it out! CentralWorld, Siam: Megamall with a well-rounded collection of shops and entertainment outlets. CentralWord has a youthful dynamic and its main focus is on trendy fashion brands but it also has brand name clothing boutiques, high-tech gadgets, beauty salons, designer furniture, and imported groceries! There are over 100 restaurants and cafes, 15 cinemas, ice-rinks, and over 500 stores total! 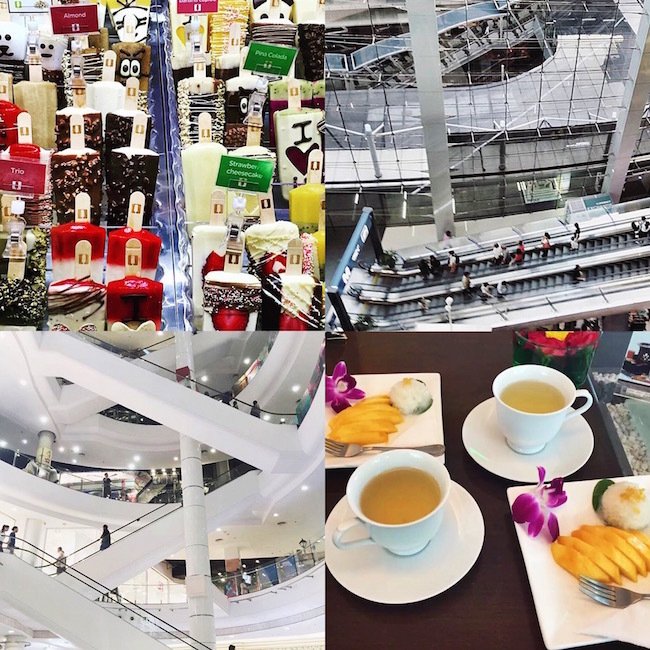 EmQuartier, Bankok: Unlike the other two malls I listed above, EmQuartier definitely leans more towards the luxury brand side! Gucci, Louis Vuitton, Chanel, Prada - you name it, they have it! EmQuartier houses 400 labels and multiple high-end fancy restaurants. Even though, most of the items within this mall were way out of our budget, I still loved drooling at all the pretty bags, clothes, and shoes! 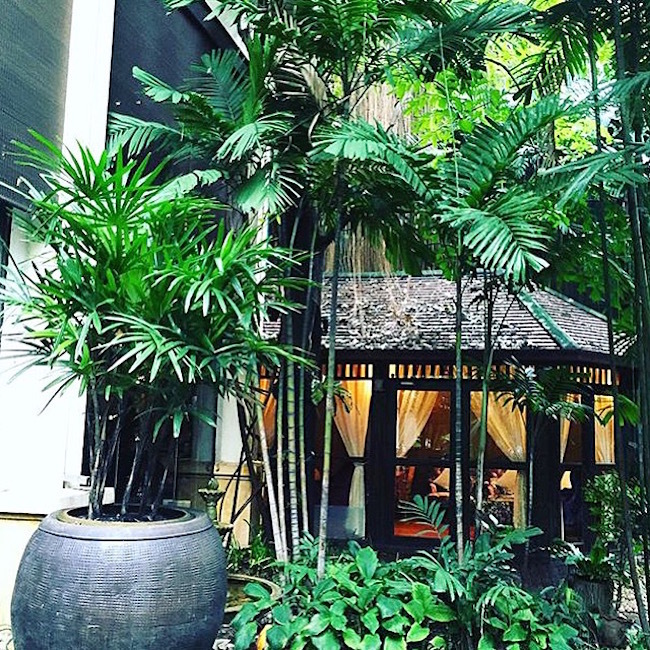 Overall there's plenty of activities to do in Bangkok, and a lot of great cafes and amazing restaurants that can be found on every corner. 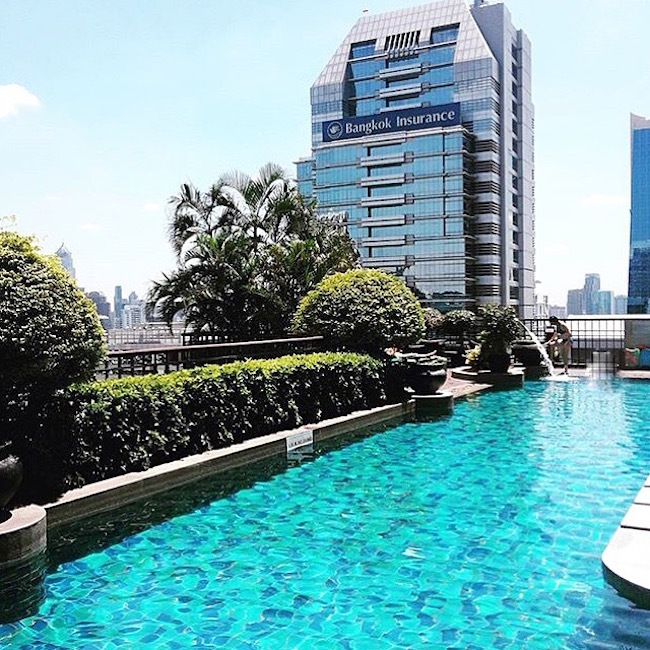 If you are looking for a fast-paced and modern city to explore in Thailand- then Bangkok is definitely the place for you to be! You will love it! 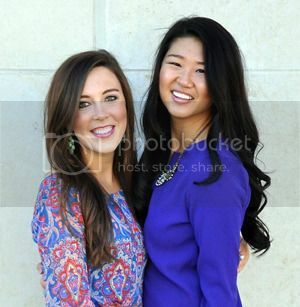 I'm loving this trend of suede and denim skirts that have been making a come back this Summer and continuing into Fall! It's a wardrobe winner no matter how you wear it - for brunch, running errands, a night out, etc. I've worn this skirt with a crop-top tank top, this ribbed knit long sleeve top (seen above) and with a cream turtleneck sweater- so versatile! These brown leather boots from last season pair perfectly with this skirt and give it that extra "Fall" touch! The struggles of wearing a floppy when its super windy outside is definitely real......Other than chasing after my hat all weekend, I had such a fun, relaxing weekend! If you follow us on Snapchat (@simplyduostyle) you probably already know that Hannah and I discovered the cutest Tea & Juice Bar and how we are obsessed with it - we went there 3 times this weekend, it is so yummy! I wore this stripped tunic top with my new favorite distressed skinny jeans (would get a size down!) during the day time and paired it with a leather jacket at the night time as the weather got super chilly! brrr! On another note, make sure to check out DITTO for their monthly glasses subscriptions! Only $24.99 for a pair of designer glasses delivered right to your door. I got these pretty Maja Vera Wang sunnies as my first pair and they are gorgeous as they came fresh with the glasses case and cleaning cloth! It is definitely worth signing up for this program if you love designer glasses but don't want to break the bank! Get your first month FREE with code "Simplyduostyle"!